Well, [single season UZR] doesn’t, unfortunately, represent hat a player did, as I explained above. In order to estimate that, you still have to do some regression. How much, I have no idea. I really don’t. So, can we just add up a player’s offensive RAR or WAR and his defensive UZR (or DRS) Nope. That is adding apples and oranges. Does everyone, including [Fangraphs], do it? Yup. Are they doing it wrong? Absolutely. I think what MGL is saying here is this: The fielding numbers we all love so much, like Ultimate Zone Rating and Defensive Runs Saved, might and probably do overestimate (or underestimate) a player’s contributions with his glove in single season. Or, what he’s saying is just this: Fielding is hard to measure. Take it with a grain of salt. 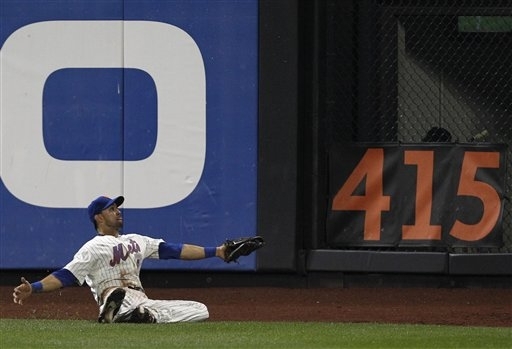 For example, Angel Pagan registered plus-15.1 runs saved by UZR this season. But, as said above, it is more likely that Pagan actually saved something closer to 10 or 7.5 runs, and UZR failed to measured his fielding correctly because is not a perfect system. In an imperfect system, everyone and everything is more likely than not to be closer to the average than initially measured — If you’re trying to guess people’s height by looking, and you decide one man is seven and a half feet tall, is it more likely that you underestimated or overestimated his height? Same idea here. It works the other way, too. David Wright, on the other hand, registered minus-10.6 runs at third base — it is more likely that he was actually 7 runs or 5 runs below average than the full 10. But when you go on Fangraphs and look at their Wins Above Replacement numbers, Pagan is given full credit for 15.1 runs, and Wright has all 10.6 runs subtracted. The 25 run gap in fielding between the two is probably smaller than it appears, shrinking the 8 run gap between the two in WAR. MGL says there is a better way of doing this — we just don’t know what it is right now. So just, take it with a grain of salt and all that for now.